CompactFlash (CF) is a mass storage device format used in portable electronic devices. For storage, CompactFlash typically uses flash memory in a standardized enclosure. The format was first specified and produced by SanDisk in 1994. The physical format is now used for a variety of devices. CompactFlash became the most successful of the early memory card formats, outliving Miniature Card, SmartMedia, and PC Card Type I in mainstream popularity. 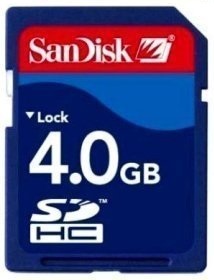 The memory card formats that came out after the introduction of CompactFlash, such as SD/MMC, various Memory Stick formats, xD-Picture Card, offered stiff competition. Most of these cards are significantly smaller than CompactFlash while offering comparable capacity and read/write speed. 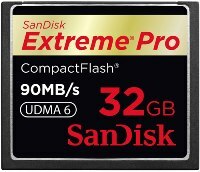 Proprietary memory card formats intended for use in the field of professional audio and video, such as P2 and SxS, are physically larger, faster, and significantly more expensive. CompactFlash remains popular, and has even experienced something of a comeback. For example, in 2008 Sony chose CompactFlash as the recording media for use in the HVR-MRC1K tapeless video recorder instead of using smaller MemoryStick cards or expensive SxS cards. In 2010 Canon chose CompactFlash as the recording media for use in its new lineup of professional high definition video cameras. CF cards are available in many different capacities. Secure Digital (SD) is a non-volatile memory card format developed by the SD Card Association for use in portable devices. It is widely used in digital cameras, cell phones, ebook readers, tablet computers, netbook computers, media players, GPS receivers, and video game consoles. The format has proven very popular and considered the de-facto industry standard, SD technology is used by more than 400 brands across dozens of product categories and in more than 8,000 models. SDSC (Standard-Capacity) cards, typically called SD, have an official maximum capacity of 2Gb, though commercially available up to 4Gb. SDHC (High-Capacity) cards have a maximum capacity of 32 GB, and SDXC (eXtended-Capacity) cards have a maximum capacity of 2Tb. An example of a camera using this media is the Panasonic AG-HC10. 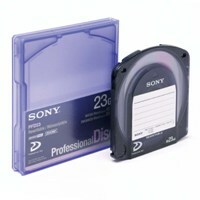 Professional Disc (PFD) is a recordable optical disc format introduced by Sony in 2003 primarily for its new tapeless recording system, XDCAM. It was one of the first optical formats to utilize blue-violet laser, which allowed for higher density of data to be stored on optical media compared to infrared laser technology used in the CD and red laser technology used in the DVD format. PFD uses a 405nm wavelength and a numerical aperture (NA) of 0.85 for the laser, allowing 23Gb of data to be stored on one 12cm disc – the equivalent to nearly five single-layer DVDs, and a 1x speed data transfer rate of 88 M/bits for reading and 72 Mbit/s for writing. Since the 23GB disc was released a dual-layer 50 GB has been developed and been released. Confusingly, this sounds very similar to the Blu-Ray format, another optical disc format using blue-violet lasers which is also supported by Sony. Even the PFD's caddy and Blu-ray's bk prototype caddy (later it was dropped) looked very similar. The only apparent difference is that single-layer PFD discs have a capacity of 23 GB whereas Blu-rays can store 25 GB. However, Blu-ray Discs currently allows a 2x data transfer rate of 72 Mbit/s – lower than PFD. This is because PFD discs use much higher quality media and drives use higher quality components, making them prohibitively expensive for the average consumer segment to which Blu-ray Discs are aimed.